What is the Sahtú Settlement Area Harvest Study? The Sahtú Settlement Area Harvest Study or Sahtú Harvest Study (SHS) was a survey of Sahtú Dene and Métis hunters, trappers, and fishers that took place between 1998 and 2005 in all communities of the Sahtú Settlement Area (SSA). The Study recorded the number and location of wildlife harvested in the SSA. To determine the Minimum Needs Level of Sahtú Dene and Métis so that their harvesting traditions can be protected. The Study was coordinated by the Sahtú Renewable Resources Board in cooperation with Renewable Resources Councils (RRC) in Tulı́t’a, Norman Wells, Fort Good Hope, Colville Lake, and Délı̨nę. All Sahtú Dene and Métis harvesters who were at least 16 years old were asked to participate. Adult non-beneficiaries who harvested for Sahtú Dene-Métis families were also included. Harvesters were surveyed by Community Interviewers on a monthly basis between 1998 and 2003, then four times a year for two more years (2004-2005). Data resulting from the Study have been available for resource management and land use planning in a raw form since 2005. However, a 2012/13 assessment indicated that the Study was incomplete in that final results and analysis had not been calculated. In 2014, resources were found to do an important statistical analysis on the harvest totals, including measures of how reliable the results are. The proportional projection method was used to extend the Study results to the entire population of beneficiaries so that total estimated harvests and Minimum Needs Levels could be calculated. No analysis of locations or mapped data was done, nor was there any analysis of the age class and gender data that resulted from the Study. Example map of results from the Sahtú Harvest Study. 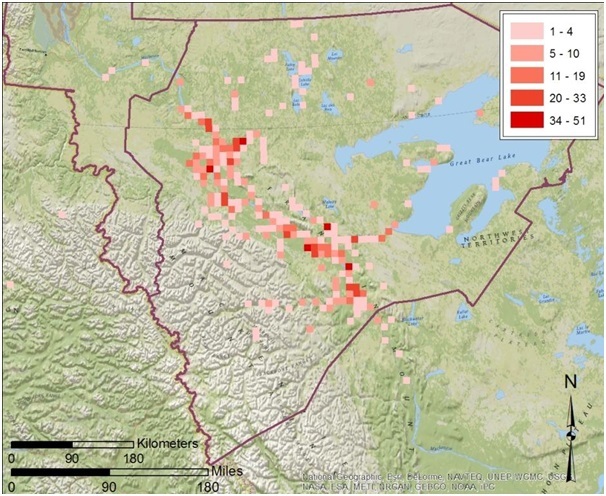 This map shows the locations of moose harvests in the Sahtú Settlement Area as reported to the study between 1998 and 2005. Harvest locations were recorded on 10 by 10 km grids. Here, each grid has been coloured to indicate the numbers of harvests. This map is based on draft numbers, and does not represent the total estimated harvest of Sahtú Dene and Métis. The information on this map is confidential; do not copy or distribute. Contact the Sahtú Renewable Resources Board for conditions of use. A draft report of the Study results has been prepared. This report includes a detailed description of the survey and data analysis methods, as well as a series of tables presenting the analyzed data. For each community, there are tables of harvester response rates, recall periods, and total estimated harvests (by month, by year, and as five or seven year means). These results are also presented for the Sahtú Settlement Area as a whole (data combined for all communities). The number of harvesters harvesting each species is also reported for the whole SSA, but not by individual community. In 2015/16 we initiated a series of workshops that provide an opportunity for community members to review the results from the Study and provide feedback on the Study and the data. The workshops are an important way of verifying and enriching the information collected by the survey and analyzed by the statisticians, and provide a meaningful local context and interpretation of the results. To date, workshops have been conducted in Délı̨nę Tulı́t’a and Rádelı̨kǫ́ (Fort Good Hope) and findings summarized and provided to the local RRCs. We are working to schedule similar workshops in Colville and Norman Wells in the near future. With increasing levels of development in the Sahtú, the past Harvest Study can be seen as having established an important baseline, or ‘best estimate’ of what harvesting levels were like at the time it was conducted. However, because the survey stopped collecting information in 2005, there is a concern that the numbers are now becoming out of date and may not be a good indication of harvesting levels or patterns today. As a result, workshop participants are also being asked to discuss ideas for future harvest studies. The workshops will be a chance for people to talk about what they think worked well in the past harvest study, what didn’t work so well, what kind of information should be collected, and how a future study could be improved.